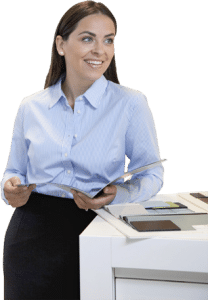 It’s important to make sure that you’re getting the right copier for your business. Not all copier leases are the same, and many times you will be getting the short end of the stick. We offer the fairest copier leases in NYC and want to show you what makes us different. We have a customer service approach that puts your needs at the forefront. You tell us what your needs are and we will find the right copier for you. Many copiers look the same but the price can vary wildly. It may not be immediately clear what you need when searching for your copier lease in NYC. Here are a few questions to ask yourself before speaking with a salesperson. What is my output of monthly prints? Do I need color? Be realistic. If you only want to get it because you think you might need it then you probably shouldn’t get it. What is the normal type of print job done by your business? Questions like these are a great jumping off point when looking for copier leases in NYC. It can help you narrow down your search, and help you find a price range. Do not get tricked into buying things you do not need. Copiers and printers have a variety of functions and the more that you have, the more expensive it will be. Try and figure out what’s best for your business and stick with it. Call today for help finding the best copier leases in NYC. We put you first, and will make sure you have what you need to make your business thrive!